On Scene: A new type of flare. A new type of flare. It's time to move on from the old type of road-flare that end up in our landfills, increase water contamination, and have the risk of catching fire. For the sake of convenience, the environment, and all around usability the Aervoe LED Baton Emergency Saftey Road Flare-Wands are where it's at. 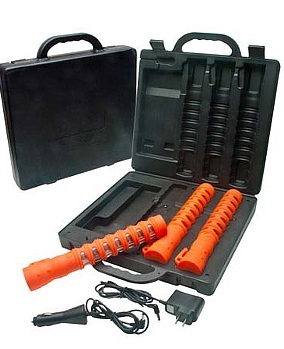 The kit includes 3 single flare-wands, 2 flex-fit tripods and a convenient plastic storage case that also functions as a charging station for the wands. One flare is chocked full with 15 LED's that can be seen up to half a mile away, are crush-proof, magnetic and waterproof. You can simply lay this on the ground as you do with any other flare, use as a hand-wand for safety, use underwater, or even use the magnet feature and attach it to a car, truck or any other metal surface. The features that this kit provides are unreal. It even comes with a way to plug and charge into your wall (AC), into your car (DC), or for your USB port. When Aervoe created this, it's obvious they thought of everything. If you think you have to be an Emergency Responder to reap the benefits of this kit, guess again. These flare wands would be beneficial at big events, in traffic directing, on construction sites, for trucking, boaters, and even in aviation. With five flash patterns, including morse code S.O.S, this is the flare-kit for you. Time to get rid of the old, outdated ones and replace with the newer, better, and more efficient. To see more detailed information and product information, click here.